In Rangoon I first remembered the Anthony David family when I was a little tyke after our arrival from Santa Cruz, Bombay where we spent two unforgettable years with my maternal grandmother, Violante (Violet) Mellor (nee Fontes), a truly remarkable Portuguese lady. It was the late 1930’s when the days were long and peacefully spent with trading the latest empty foreign cigarette packs with the kids on the block, spinning tops, racing bicycles, and us kids running helter skelter after cut-off fighter kites of the most exotic kinds which only Rangoon kids would know how to fly and cut off one another’s prized flyers in the skies thousands of feet above the apartment buildings on our city street. “Off 'eee goes!” would be screamed by every kid on the block when one of these cut-off kites would be seen sailing vicariously in the high March winds, trailing their abrasively sharp powdered glass-glued-on- thread ,or manja, tantalizingly along for dozens of kids to chase and capture. Those were the high halcyon days before a war or even a rumor of war intruded into a child’s thoughts or memory. Anthony and Margaret David, and their two kids, Henry, and Marjorie, who were older than me, were old friends of the family. She, a Eurasian of Indo-French extraction,was petite and pretty while the girl resembled her, or so I noted shyly. But mostly I remember “Uncle David” who was not really a relative but whom we called “Uncle” as all Burma kids called the family’s male friends as a sign of respect. He was a quiet and well dressed Tamil gentleman who visited Dad’s office with a large valise containing literature and lots of ampoules of different injectables which a pharmaceutical rep usually carries for a doctor’s appraisal. And while they consulted with one another, his wife, who often accompanied him, would visit with Mom while we would jostle with the kids for the sweet goodies which usually accompanied these visits. The only interruptions to any get together was Uncle’s wheezing cough which became quite noticeably loud at times but which seemed to subside after his quick exit to the wash room where he probably medicated himself. He would return to the group wan and tired, but would try his best not to look flustered. You could tell, though, he was long suffering with his malady, and we felt a twinge of worry for our dear friends’ father. Dad, who some called “a physician’s physician”, would observe him closely, and counsel him quietly, but would not interfere with his treatment probably because of his strict professional habit to avoid getting emotionally involved in the treatment of his family or close friends. He would, instead, refer us or them to top specialist colleagues in the City. On one occasion, though, something changed in the doctor/patient relationship when Uncle had a particularly severe attack in Dad’s office and in the flurry which followed, all of us were shooed out of it while Dad treated him. Soon we heard relief in Uncle’s voice, and we all rushed in to check on him. Dad was already putting away his paraphernalia while Aunty and Mom hovered near like ministering angels. said Uncle David, matter of factly. Apparently, soon thereafter, there were a few episodes when Uncle’s office made emergency calls to Dad for him to obtain help. Instead of these interludes of everyday living, soon there would be declarations of War and frightful names to be remembered like ‘Pearl Harbor’, ‘carpet bombing’ and the mad rush of ‘evacuation’ of thousands of civilians out of a city in flames… bombed indiscriminately by the Japanese Air Force on the day before Christmas Eve, and on Christmas Day, 1941. Like some of the thousands of others we escaped on February 5, 1942, like packed sardines, on one of the last trains to leave Rangoon for Mandalay in central Burma, and then onto Maymyo, the lovely manicured, quiet, Sussex- like town located in the mountains of the Shan states which the British made their summer capital. It was an ideal place to recapture the tenuous peace which would not last long what with the lightning speed the enemy forces had mustered to subdue the Allies in the south. 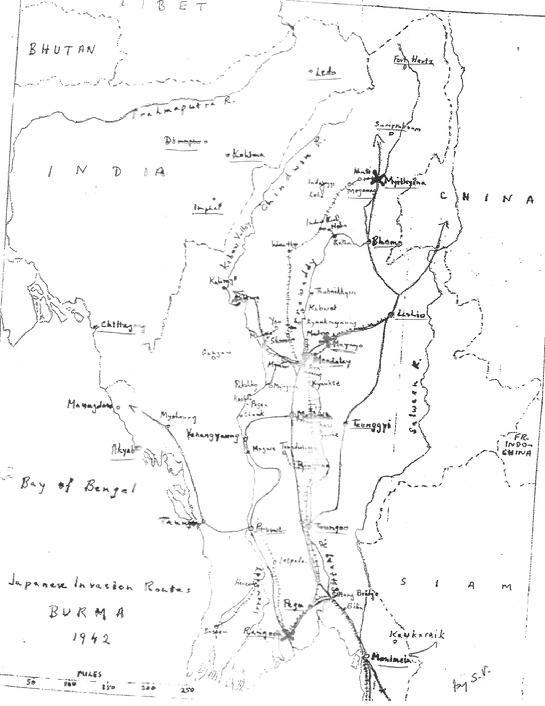 Dad, a public health physician assigned captain in the British Army of Burma medical reserves, got on the last hospital train to leave Rangoon for Prome by a stroke of luck. He was spotted amongst hundreds of others by two English colleagues, arch rivals on the power track at work, looking distractedly for his Vauxhall and chauffeur who never returned. “Peter! Peter!” they screamed, and as he ran up to them he shouted “Help me! Help me!” as they pulled him up onto the rear of the moving lorry the British had commandeered. While I’m sure that my parents and older sisters must have worried about the safety of the Davids, and the dozens of other lost relatives and friends in the weeks that followed, I didn’t. So confused was I, a small boy of ten, in the fearful turmoil and trauma of the events which followed in quick succession, that I never gave them a thought until we met up with them months later on May 7, 1942 in a sea of surging humanity trying to make their plans for a last desperate attempt at escape to India from Myitkyina, in northern Burma. We hugged and kissed them good bye and then Uncle David approached Dad with tears in his eyes and they hugged. I never forgot the look in Uncle’s eyes: they were of gratitude and sadness, but not of fear. And I wondered about that when I remembered his mad dashes to wherever he could find Dad in town, for his “shot” to allay his asthmatic attack. How will he manage I wondered. “So, tell me what happened!” I insisted in my then very usual, sensitive fashion. “I’ll tell you a story’ he said, and coming from one who was always so busy as to never have the time to tell us a story, I sat up and listened. He then quietly pretended to shuffle some things on his desk with his right hand maimed in a Kempetai torture session, and, as many survivors of war and trauma will do, skirted the details which were too painful to recall. “It was because of Mummy I didn’t go through the details of the trip when I rejoined you in Maymyo …” I looked at him and nodded in respectful understanding, thinking of Mom’s heart condition. A suitable expletive came to mind, but I did not give vent to my spleen in his presence. It was his prerogative to say that word, given this abuse to his professional and personal sensibilities, and it seemed to give him some relief. I didn’t, but slowly he recovered and told me of an incident he, and I, would never forget. It appeared that he had lost all sense of time in the chaos they found themselves in, and having to seek refuge as far away as he could from the targeted train he walked into the jungles and soon became lost. Fortunately, in the increasing dusk, he came across a Burmese villager who directed him to a dak bungalow, which was usually a small wayside house set aside for use by civil administrators on tour. Thankfully he reached the place, but found it was now minus its maintenance staff, and so all thought of a meal went out the window. But he did find an artesian well with pump and managed to douse himself with buckets of water, find a small room and go off to a deep exhausted sleep on the bare floor with his medical bag and jacket tucked under his neck. He spent a very fitful night’s sleep disturbed by recurring nightmarish episodes of the experiences he suffered that day. Was that Anthony David calling out to me, he wondered, and quickly negated that thought. How could that be miles from Rangoon, and in the middle of nowhere? The stillness of the night, now bereft of even the jungle sounds, gave those voices the lie, and so he turned over, and felt for his Army issue revolver in his jacket. And then again the tremulous voice distinctly of Uncle David was heard coming from the next room: “Peter! Help me!’. Dad jumped up, automatically grabbing his medical bag and rushed into the room. And there he was in the flashlight's beam, Anthony David no less, throttling in terrible exertions to breathe! Dad quieted him, reached into his bag, took out an ampoule and calmly injected about 0.1 cc of sterile saline into his arm! “That day at the office in Rangoon when Uncle had an attack? I decided to use saline, as a first step, to rule out a psychosomatic basis… it worked beautifully, didn’t it? Editor’s Note: The Davids disappeared that day, May 7, 1942, along with the other families we saw taking the Sumprabum route to India. We never heard or found a trace of them after the hostilities, and wonder to this day whether their lives were spared. We would be most grateful for any information in this regard. A Follow Up: The above note was placed in 2004. It is now the middle of October,2015 and there has not been a single note to me of the whereabouts of the Anthony David family or any other persons mentioned in this piece. 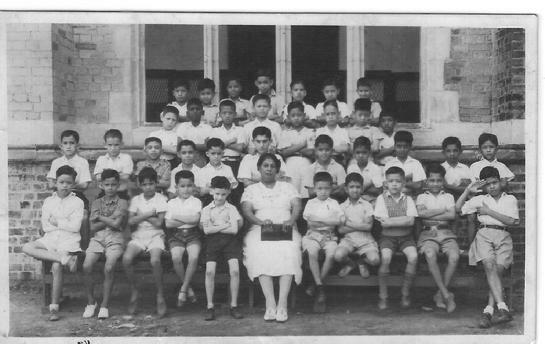 I would greatly appreciate it if the good Sisters of the Loretto Convent in Kolkota (Calcutta), India could contact me at josephvalu@worldwar2burmadiaries.com if they were able to find any references to Anthony and Margaret David and/or their children David and Margot/ Marjorie, among the records of refugees from Burma compiled by their compassionate Order in 1942. Additionally, I have learned that several persons have tried to contact me on this matter via the Burma Star's very helpful site: www.shwepla.com which now appears to be inactive as I have received none of those messages. I would be most grateful if the Burma Star organization could throw some light on this.